After a rather terrible attempt at Earl Grey ice cream (it tasted like an overly milky cup of tea that had gone cold with a dishrag soaking in it. Yum. ), I made this. Bit of a contrast. I had forgotten how divine coconut is. In ice cream form it becomes insanely good. Then add the cherries... wow. Helen is a genius. 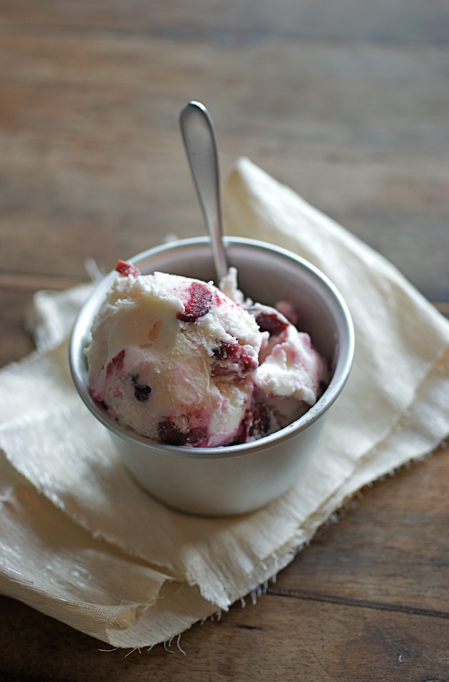 This is an incredible summer ice cream - it feels really light and refreshing while still being creamy and delicious. It's not too sweet either. I didn't have any food grade dried rose buds so I just added a tsp of rose water instead. I'm sure it would still be yummy without. I also halved the recipe, which I now regret! 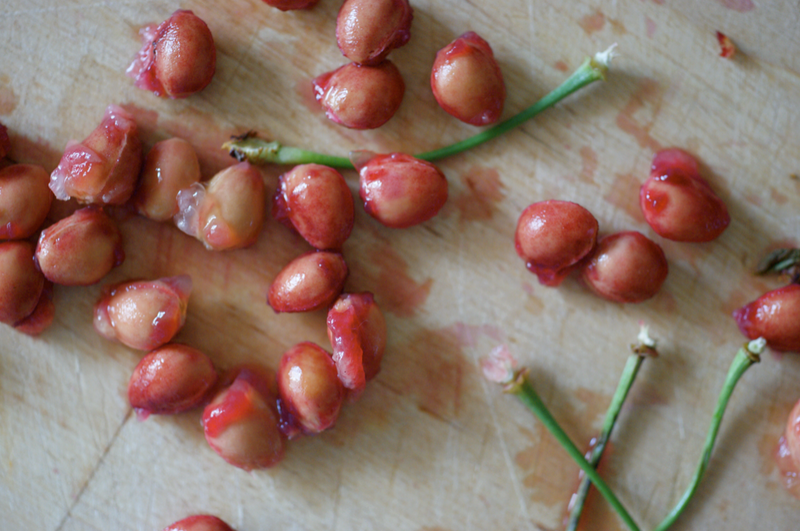 Pit and halve the cherries. Place all the ingredients in a small pan and bring to a simmer. Put to one side and leave to steep for an hour. (I made this the day before with the ice cream base and kept it in the fridge). Put all the ingredients in a medium pan. Heat over a medium heat until the sugar has dissolved. Pour into a jug and leave to cool before placing in the fridge, preferably overnight. Churn according to the instructions with your ice cream maker. 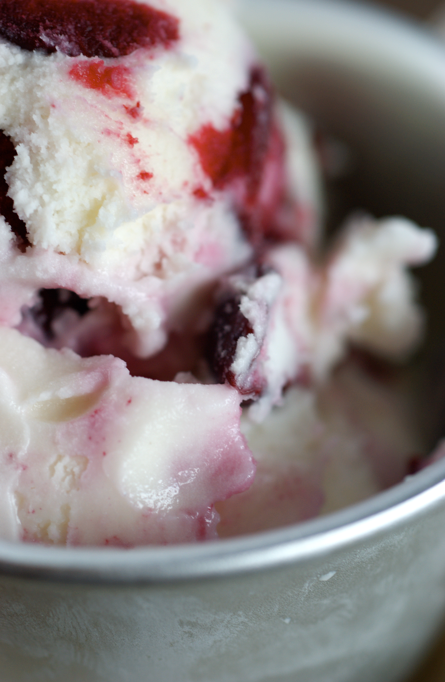 Take out the cherries and about a tbsp of the liquid they have been soaking in and swirl into the ice cream with a spatula. Put in the freezer to firm for a few hours. Do you have a Poires au Chocolat profile on Twitter or Facebook yet? That looks wonderful, and I agree that coconut is magical in ice cream. I'll have to see if I can still find cherries to try this! Oh, and I love Earl Grey tea, so was intrigued, until I got to your description of the taste. Guess I'll stick with a hot cup! Do you have 'The Perfect Scoop'? 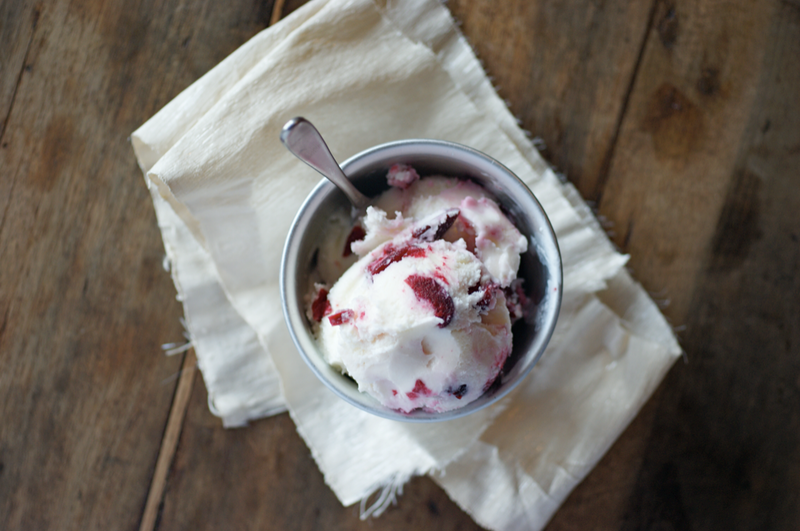 Try the almond and cherry icecream from there. It's devine!!! Almond base and candied cherries mixed through. I love coconut and cherry too.